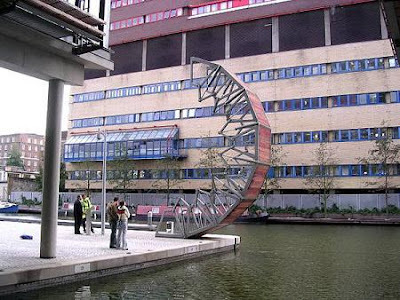 A curling bridge is a type of movable bridge, of which the sole example shown here is The Rolling Bridge, built in 2004 as part of the Grand Union Canal office & retail development project at Paddington Basin, London. 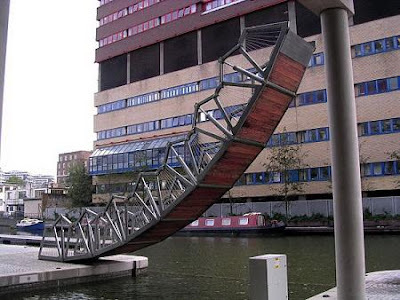 he bridge was conceived by British designer Thomas Heatherwick, designed by SKM Anthony Hunt with Packman Lucas, and built by Littlehampton Welding Ltd. 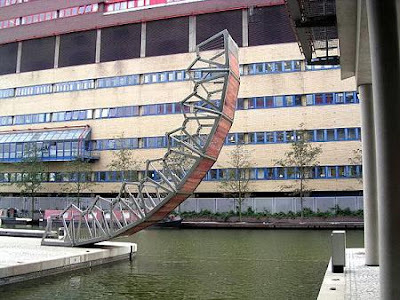 The bridge consisted of eight triangular sections hinged at the walkway level and connected above by two part links that could be collapsed toward the deck by hydraulic pistons, which were concealed in vertical posts in the bridge parapets. 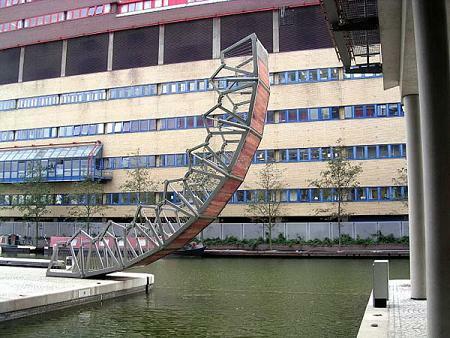 When extended, it resembled a conventional steel and timber footbridge, and was 12 metres long. 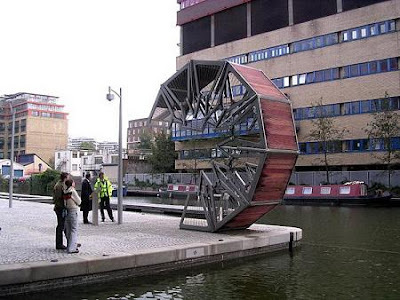 However, to allow the passage of boats, the bridge could be made to curl up until its two ends touched, to form an octagonal shape measuring one half of the waterway’s width at that point.When operational, the Rolling Bridge was curled up every Friday at noon. The bridge was removed in Summer 2008, and it is not know whether it will be re-installed. 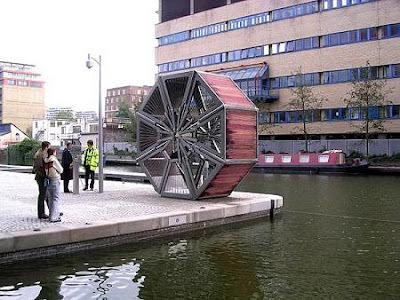 Although no official explanation has been given, locals in the area believed it had suffered from vandalism, and was too expensive to repair and maintain.